I admit it; I am 60. It happened suddenly. One day I was 25 and getting married. And moments later I was 60, married for 35 years and had two adult children. How did it happen? I am not sure. But I will tell you that I do not feel 60. In my mind I am much younger. How old, I am not sure; but definitely NOT 60. I walk between 2 – 5 miles daily. I exercise. I work. I volunteer. I do word puzzles. I write. I read. I crochet. I visit with friends. I shop. I keep moving. I am mildly obsessive and overly concerned at times. Most people I meet do not think I am 60, except perhaps for the grey hair. I do not get my haired dyed. And many times I am in a room with women my age and older, and I am the only one with grey hair. So I guess that might indicate my advancing age. But recently, I realized that in fact I was 60. I realize that being 60 has made a few changes in my life and how others view me. Perhaps, it is just others who do not really know me. It happened in Rome. My husband and I arrived on a Wednesday, arriving at our hotel about 11 am. Once we got into a room we decided to go exploring. 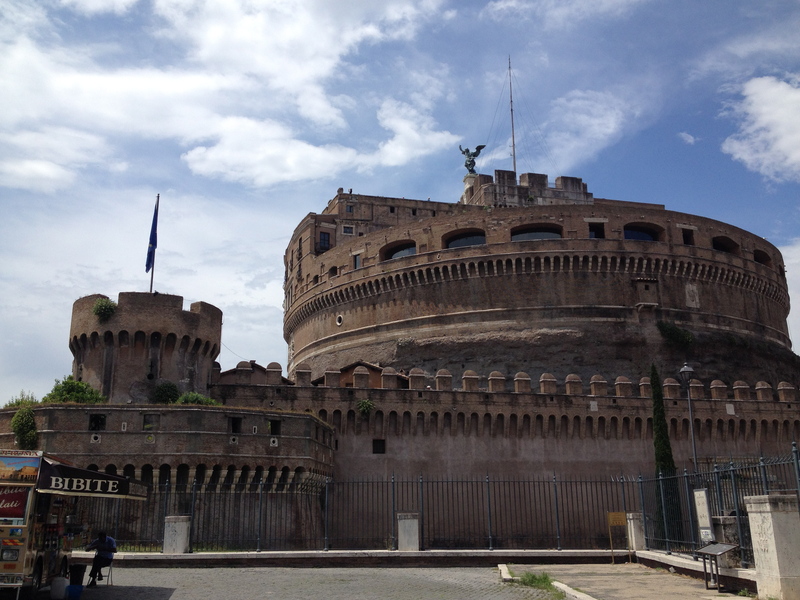 Close to the hotel was the Castle of Saint Angelo, a lovely spot to investigate. We spent hours there going room to room, inside and out, lost in the corridors that date back centuries. The Castle of Saint Angelo. We finally found our way out and walked back to our hotel for a nap before a meeting and dinner. Imagine our surprise when our host arrived 45 minutes early. We were tired, but we got it together. He took us to tour the Basilica of San Paola and its cloister. Then to the Bambino Gesu Hospital, Children’s Hospital of Rome, for a short tour and where my husband presented a talk to the allergy section. From there it was out to dinner with 13 others for a five-course Roman meal….delicious. And then a two-mile walk to what we were told was the best gelato in all of Rome, the Gelateria Frigidarium. It was delicious. But we did not get back to our hotel till midnight. Now after traveling for 20 hours, touring and a giant meal and gelato, I was tired. But with jet lag, I still did not sleep that well. 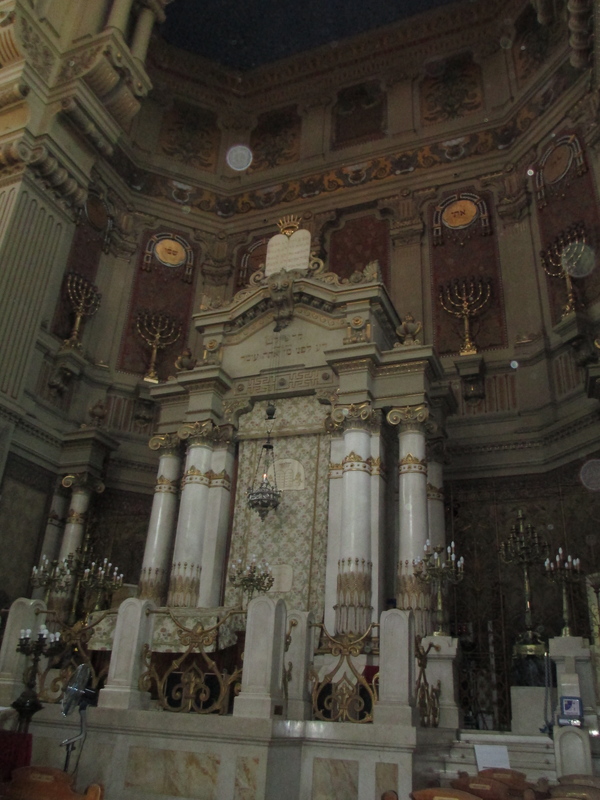 And we had to be at the Jewish Quarter by ten in the morning for a three-hour tour organized by Jewish Roma. We did it. It was wonderful. We ate lunch in the Jewish Quarter then grabbed a taxi to get to the Vatican where we had another, 2:30 pm tour scheduled. A portion of the ceiling in the extremely long reception hall, also known as the map room because of the frescos of different areas of Italy. Also planned by Jewish Roma, we had a semi-private tour with one other couple. I would say they were in their late 30s and the tour guide, perhaps in her late 40s. 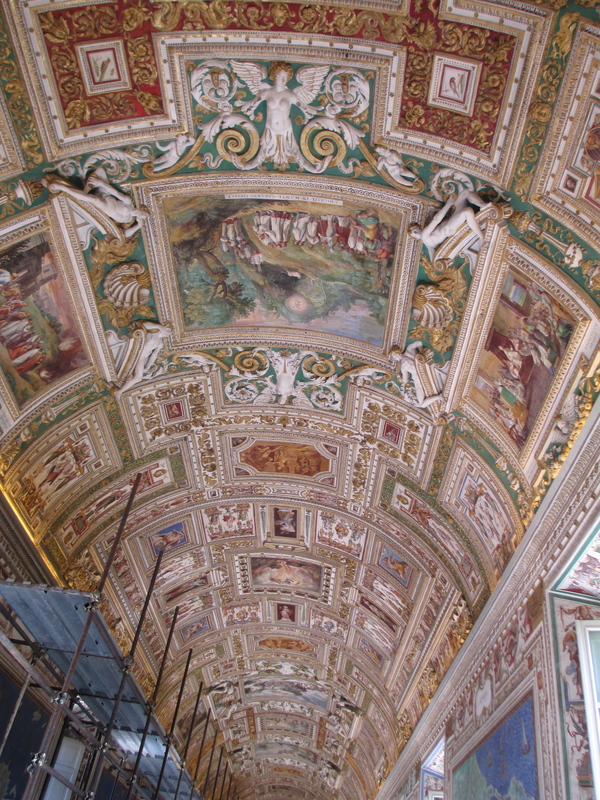 This tour would take us through the Vatican Museum, not air-conditioned, to the Sistine Chapel. The museum winds it ways through room after room of art works. Long halls, galleries, so much to see. So much walking!! And finally, we are all herded into the Sistine Chapel where everyone stands and looks up ward at the magnificent art drawn by Michaelangelo. At least it had some air conditioning. Okay, we can. We walked over and my husband and I sat down. I looked over at him. He looked really tired. I must look tired as well, I thought. Then I looked up. The three younger adults were looking down at us. And I had a epiphany moment, I knew what they were thinking. They were thinking that we were worn out. They were worried about us. Would these seniors make it through the tour? Are they ok? Wow! I now know what my parents thought when I sat them down somewhere to rest. And you what? I needed that rest. It felt wonderful! After a few minutes, perhaps ten, we said we were ready to go on. Really, we reassured the guide and the couple. And on we went. When the tour ended my husband and I went into St. Peter’s Basilica for a while. But after about 20 mintues, I was done. It was time to go back to the hotel. And I was not going to walk!!! Even though my husband assured me it was just about a mile. NO! I won. We walked to the edge of St. Peter’s Square and got a cab. Back to the hotel. It was about 5:30 pm. I took a quick shower and went to take a nap. My husband said he tried to wake me at 7 pm, for dinner. I did not move. I also did not move at 7:15 when he tried again. Finally at 7:30 pm, I did wake up and we went out for dinner. We went just a block from the hotel to a lovely restaurant; then on to a gelato shop for dessert. It was a wonderful day. We walked another six miles. We saw so much and learned so much about Rome. But we also learned that we are 60 years old! I spoke to my daughter a few days before her 29th birthday (yesterday). She lives in Israel and I live in the Kansas, so we spoke through a video chat. (Always makes me think of 2001: A Space Odyssey, when the astronaut calls his family from space.) My daughter was bemoaning her advancing age. We both laughed. But the truth is, I do not feel old. I feel pretty wonderful. I recently participated in a two-day workshop on “Wise Aging” presented by instructors from the Institute for Jewish Spirituality. Although it was presented in Kansas City, there were participants from through the Midwest. We all learned how to be facilitators in this new program to help people transition in to the next stage of life. I was surprised when I was called by our rabbi’s wife and asked to participate on behalf of our congregation. But she told me that she thought of me immediately when she realized she could not attend, as I was aging so wonderfully. That was two weeks before my 60th birthday, and I will admit to a bit of concern. But okay, I would do it. The two-day workshop was intense and exhausting. Fourteen hours of learning and interacting with the other trainees as we attempted to learn about the Wise Aging program, bring this program to life and learn to teach it to others. I loved the idea of helping people see themselves as elders as opposed to elderly. As we age, we have so much to give to others. We can mentor and teach from our experiences. There was one part of the program I found distressing. There was much discussion about teaching people how to let go of bitterness and learn to forgive those in their past who might have hurt them. It seems many people, as they age, hold on to old hurts and real or imagined insults. I say, “let it go.” As does this program. Let go of these feelings because bitterness only makes you feel worse. I am a firm believer of the rule of Rosh HaShannah and Yom Kippur to say I am sorry to any one I might have hurt and to forgive anyone who has hurt me. It is so much easier than carrying all that baggage around. And it makes life so much more joyful. This workshop opened my eyes to how others see themselves as they age. Whereas my husband and I are really enjoying our lives as empty nesters, others seem to have a difficult time. So I say. Go to a lecture. We try to go to a program at least once a week. There are many free lectures and programs available. Go to a concert. Take a weekend trip if you can. Get a kitten. Having a pet does wonders for people as they age. Travel with friends. Yes the body starts to give out a little. But exercise is wonderful for keeping your body healthy. You do not have to run marathons like my meshugganah husband. But you can walk. I walk two to three miles almost every day. Do something different. Yesterday, in honor of my daughter’s birthday, a friend of mine and I went to the new IKEA store in Kansas. I had not been there yet. We walked all around the showroom and the marketplace and the warehouse. I got lots of walking in and bought a few accessories. 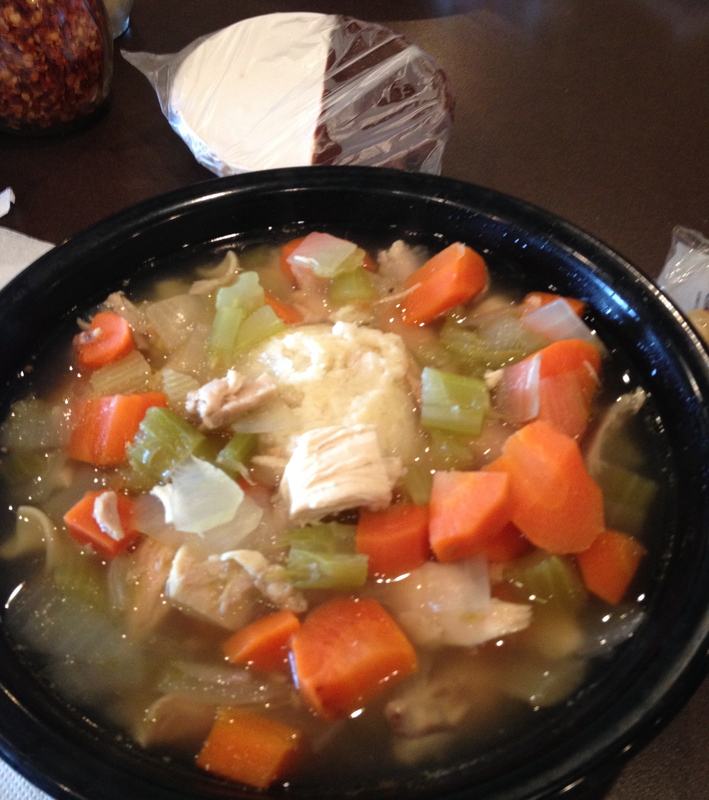 Then we went out for a bowl of chicken noodle soup and shared a black and white cookie at a deli. Happiness can be a bowl of soup and a cookie! Find things that make you happy. And be happy. You have so many experiences to share and so much good to do. Volunteer for an organization you love. Meet new people. Keep being curious. My curiosity has led me to investigate further into my family history and I have found cousins I did not know I had. I love a mystery and solving it. Now I am focus on the mysteries of my family. There is so much to do and so much more time to do it, now that I no longer have children at home. So I plan to continue to age wisely and joyfully. I hope my example will help my daughter accept her almost 30 years and age joyfully as well.